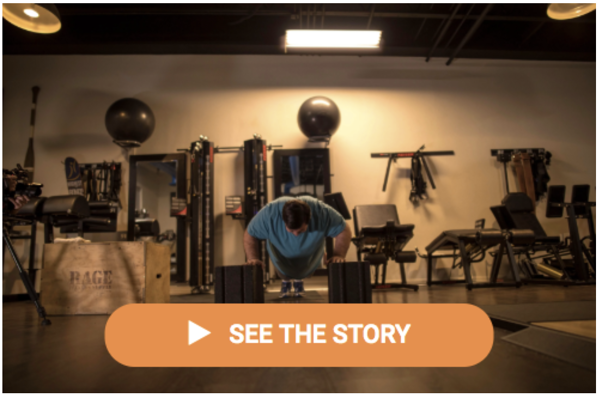 Let us introduce you to Donald Berry: father of six, a former competitive weight trainer, and a patient of DISC Sports & Spine Center who had suffered with back pain for many years. He is just one of the five patients that we interviewed during the discovery process to identify buyer personas for the practice’s website redesign project. His story was, unfortunately, all too common among those that we spoke to throughout this project. Patients like Donald had been suffering with pain and been misdiagnosed or given incorrect and ineffective information to relieve their pain. Dr. Robert Bray of DISC Sport & Spine Center is a world-renowned spinal surgeon who came to SmartBug Media to redesign the company’s website on the HubSpot platform, start an inbound marketing program, and help the organization connect with patients like Donald Berry and share those success stories on a new website. 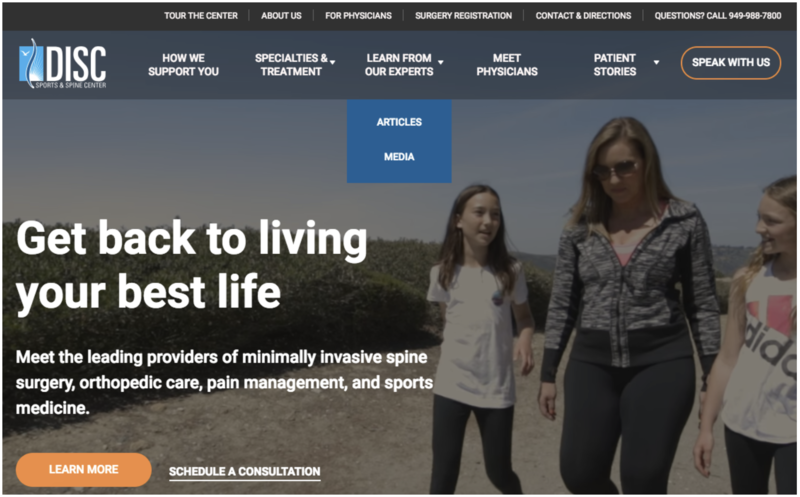 The old DISC Sports & Spine Center website was built on the WordPress platform and hadn’t been updated for many years prior to hiring SmartBug Media in the fall of 2017. The website looked outdated and was performing poorly when it came to lead generation. There were limited opportunities for visitors to convert on the website because there was only one form to request an appointment as shown below. There are hundreds of hospitals, physicians, and healthcare centers in Southern California serving nearly 24 million people and offering spine care, orthopedics, and pain management services. As the competition within the marketplace continued to grow rapidly in 2017, DISC Sports & Spine Center knew that it needed to hire a marketing agency to help it stand out from the competition and continue to bring in new patients to the practice. The brand needed to optimize its new website for local SEO and highlight its world renowned specialists, state-of-the-art outpatient surgery centers, promote its Zero Surgical MRSA Infection Rate at the Newport Beach location, and share patient success stories. DISC Sports & Spine Center believes that in “many orthopedic and spine issues, the most aggressive intervention is not necessarily the most advantageous one.” Therefore, it was important to communicate this message throughout the new website and appeal to the brand’s buyer personas and target audience in Southern California. DISC Sports & Spine Center also recognized that more and more people, particularly those living in warmer clients such as California, are seeking ways to live a healthier and more active lifestyle. As such, the website needed to target people who were looking to improve their overall well-being, which meant using plenty of health and wellness images. To appeal to its target audience, we needed to create a new sitemap that outlined the most important information based on the personas’ buyer’s journey. We created new resources for contacts to download and read about spine care and to assist with lead generation. While designing the new website, DISC Sports & Spine Center developed several new videos to share their patients’ stories and to help visitors connect with the physicians. We needed to write and create new support pages and allow the website visitor to tour the facilities while online, too. We added additional CTAs in bright orange throughout the website to make it easier for visitors to research information about treatment options, learn about the physicians, and request an appointment or speak with DISC Sports & Spine Center. Throughout the website, we included photos of individuals horseback riding, running, weight lifting, riding bikes, and hiking to appeal to the target audience that is living a more active lifestyle in Southern California. 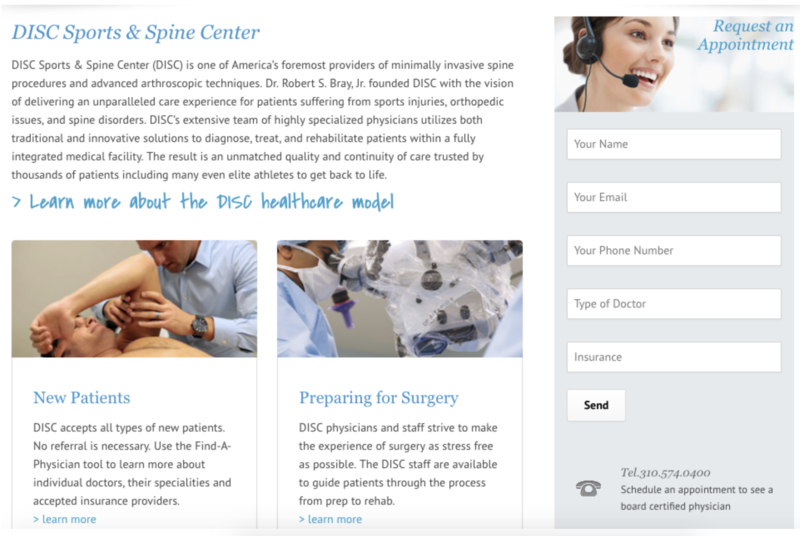 DISC Sports & Spine Center also gained 21 new SQL contacts that requested an appointment or to speak with the company within the first week of launching the website. This surpassed the goal of 15 new contacts for the entire month! Over the course of almost two months, DISC Sports & Spine Center has received 81 new SQL contacts that have completed a form to request an appointment or to speak with someone at the centers. The blog has also received more than 5,500 views from weekly posting and organic traffic resulted in 48 new contacts due to improving the website’s on-page SEO. Our team was personally touched by DISC Sports & Spine Center physicians, not only while working with them on the website project but also through the treatment of a family member of a SmartBug employee. This individual became a patient of Dr. Bray’s during the website project and was treated at the surgery center. While undergoing treatment, they met with 10 different staff members, all who knew about the redesign project and couldn't stop talking about the impact the website had had on the organization. These staff members were grateful that they could impact even more lives through connections made on the new website. Before working with SmartBug Media, the goal was to increase the number of surgeries generated from the website’s online requests to five a month. After the website launched, Dr. Bray alone started performing three surgeries per day! The total number of surgeries performed per month has more than doubled since launching the new website.